Former Vernon Selectboard member Mike Ball was an advocate for the town hiring a Town Administrator. Town Meeting voters maintained the funding for the position as proposed despite two attempts to cut the funding and the scope of the job. VERNON—The Vernon School Board members might need to sharpen their pencils for a school budget redo. Unofficial election results show voters defeated the $4.4 million school budget by four votes in an Australian Ballot on March 3, in a 245–241 defeat. Voters at Annual Town Meeting also approved funding for a full-time town administrator, eliminated the elected town auditors’ positions, approved a move of the preschool program from the town offices to the Vernon Elementary School, and rejected a call to reduce the number of Selectboard members from five to three. 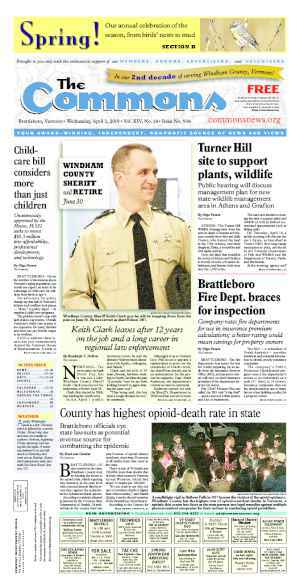 The town will maintain funding for the Windham County Sheriff’s Department, which provides around-the-clock police services under contract. And according to the Vermont Secretary of State’s office, concerns that the meeting was improperly warned, and thus illegal, can be addressed by a legal remedy that is as simple as a future meeting. Contentious debate between the elected auditors and the Selectboard filled Monday’s meeting, the first of a two-night serial that took place March 2 and 3. In the end, voters approved eliminating the elected auditors’ positions in a 109-100 paper ballot vote. Tuesday’s meeting dealt mostly with municipal financial articles. Voters passed the financial articles from the floor. Unofficial election results also saw changes in the Selectboard. Incumbent member Sandra Harris lost her three-year seat to returning board member Michael Courtemarche in a 242–238 vote. Newcomer Emily Vergobbe won a two-year seat over Bob Miller, 251–223, to replace board member Janet Rasmussen, who decided to not run for another term. In its first board meeting at the end of a long night, the newly formed Selectboard approved Christine Howe as board chair, Courtemarche as vice-chair, and Vergobbe as clerk. Voters overwhelmingly approved the fiscal year 2016 municipal budget in a floor vote. The $2.1 million fiscal 2016 budget included an amendment for rental fees for classroom space from the pre-school program to the Vernon Elementary School and a $50,000 salary for a full-time town administrator. According to board members, the fiscal year 2016 municipal budget represented a $6,557 increase. Relocating the preschool program from the basement of the town offices to the Elementary School will allow the program to expand from 14 to as many as 20 students, said Recreation Department Director Seth Deyo. 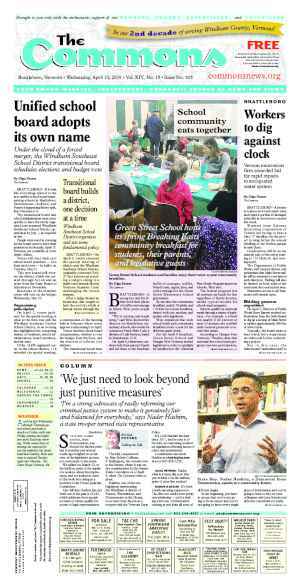 Deyo asked voters to amend the Recreation Department’s budget, increasing it to include $154,123 to rent classroom space at the elementary school. He described the relocation and rental fees as a win-win for taxpayers. According to Deyo, raising the fee through the municipal budget lowers the amount the school needs to raise through taxes. As a result, voters would decrease their school tax bill by an average of $39.19. “That’s the true dollar benefit to all,” said Deyo. Voters proposed multiple amendments to the municipal budget. None of these amendments passed with the exception of the pre-school rental fees. 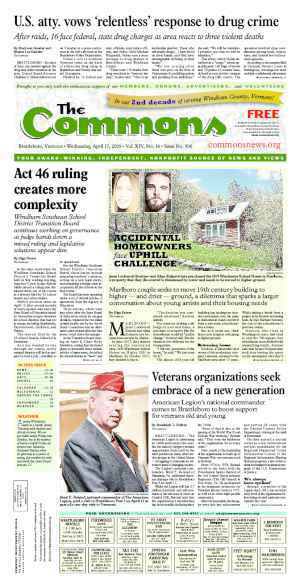 One voter proposed reducing the coverage provided by the Windham County Sheriff’s Department from 24/7 coverage to 120 hours a week at $205,000. This amendment didn’t pass. The Sheriff’s Department will provide around-the-clock coverage in Vernon for $233,950, a 1 percent increase. Discussions about funding for the Sheriff’s Department lacked the earlier tensions between the department and the Selectboard. Last month, when Sheriff Keith Clark read an open letter to the board, he stated that he needed assurances from board members that they would not interfere with the department’s operations. Last fall, board Chair Patty O’Donnell took issue with the department’s handling of a traffic stop that resulted in her intervening and advocating for the resident, who was arrested for driving under the influence of alcohol. A grand jury recently declined to charge O’Donnell with obstruction of justice charges. For her part, O’Donnell said in the meeting that she “was concerned about aggressive behavior” of the officer who made the stop and said Clark had invited Selectboard concerns about the execution of his department’s contract with the town. That controversy spurred tensions on both sides, with Clark in his letter writing that he was “reluctant to provide contract policing services” to the town. At the Selectboard meeting, Clark backed away from the stand after board members and Town Attorney Richard Coutant affirmed their willingness to move forward. “I look forward to working with the board, whoever the members may be, whatever positions they may have, to negotiate a new contract, if it is approved at town meeting for us to continue to provide services,” Clark told the board before he left the meeting. 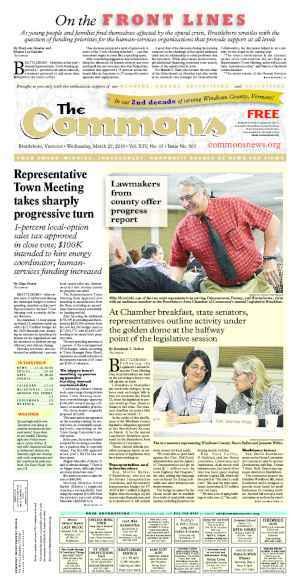 An amendment to cut $50,000 to hire a Town Administrator, proposed by Vince Johnson, was also defeated. After voters defeated the Johnson amendment, they also defeated an amendment to cut the proposed full-time position to a part-time position. The board members said they needed someone who could help the town tackle its slate of growing issues like economic development and manage human-resource issues. The board stressed the need for someone with grant-writing skills. O’Donnell said the town needed such a person to help find revenue sources to replace the money Entergy pumped into the economy before the Vermont Yankee nuclear plant shut down last December. Many residents questioned if spending money to hire a full-time town administrator would be prudent. “I think in the future it would be a great benefit to the town but the town just isn’t ready for it now,” said Johnson. Another resident said, “I really am having a hard time with this because we’re getting mixed messages” about Vernon’s financial state. “Why are we doing this at a time we need to cut the budget?” the resident asked. Former Selectboard member Mike Ball urged his fellow voters to approve the salary for the new position, calling it a “boots on the ground” role that could help with human-resource issues. “The Selectboard does not engage with the employees on a daily basis,” he said. Early in Tuesday’s meeting, a resident raised the concern that the Town Meeting may not have been properly warned and therefore not legal. According to a report sent out by Town Clerk Susan Miller, the Selectboard had missed the state’s deadline for approving and posting the meeting warning. As a result, the Legislature has provided a way to rectify such mishaps with the meeting warning, he said. The town will need to hold a special “validation meeting” to approve the actions taken on March 2 and 3 as described in the state statutes under 17 V.S.A., subsection 2662, said Senning. Town Moderator Tim Arsenault opened Monday’s meeting with an overview of Roberts Rules of Order and a healthy dose of reminding people to treat one another with respect. Passions might run high at Town Meeting, he said, but personal attacks would not be allowed. “Tomorrow morning, we must work together as a town because that’s what the people who brought us up and taught us manners would have wanted,” said Arsenault. Unfortunately, Arsenault’s plea went unheeded by some, and he need to remind people over the course of the night about refraining from personal attacks. Discussions became pointed during debate to eliminate the elected auditors’ department. The Selectboard and elected auditors threw barbs at each other during the meeting. When the name of former auditor Barbara Moseley was mentioned, board member Jeff Dunklee quipped that the audience should do the revered lady a favor and not utter her name in the same breath as the current auditors. In a report, the elected auditors described the Selectboard as bullies. Last year, voters approved a substantial cut in funding for the elected auditors’ department in favor of paying for an outside accounting firm. Selectboard chair Patty O’Donnell Monday night repeatedly reminded voters that they approved the cuts twice last year — once at Town Meeting and again during a Special Town Meeting. O’Donnell told voters that the town decided to hire a professional firm based on guidance posted on the website of the Vermont League of Cities and Towns. According to O’Donnell, the challenges faced by auditors are complex. Supporters of keeping the elected auditors’ department countered this argument, saying that elected auditors work for the taxpayers and would provide a needed layer of objective oversight. A private firm, however, works at the pleasure of the Selectboard. Resident Munson Hicks spoke in support of keeping the elected auditors position. “They are our people,” he said. The Selectboard will direct the private auditing firm, Sullivan, Powers & Co., which will turn over a report once a year, he said. “Well, they didn’t even make the deadline,” said Hicks of the firm’s report being absent from the town report. Now residents must vote on a new budget without knowing how the town did in the previous fiscal year, said Hicks. The firm did not complete the town audit in time for it to appear in the annual town report. O’Donnell shrugged off the omission, saying that technically the auditors’ report was not due until June. Missing reports, and finger pointing over who was responsible for handing them in, added fuel to the discussion. Board members, however, sniffed that the elected auditors had defied Vermont statute by creating a report separate from Vernon’s Annual Town Report. The elected auditors groused back that the board’s secretary had sent an email telling them they were not required to submit a report for the Town Report this year. In the separate “2014 Town of Vernon Reports — Elected Auditors & Town Clerk” document, the auditors provided their point of view on soured town relationships. The auditors claimed the disagreements went beyond the board’s attempt to save the town money. The auditors outlined that any savings resulted from a cost shift from the auditors’ department to other departments like the Listers or monies paid to the outside auditing firm. The auditors continued calling out the Selectboard for trying to control other elected officials. They stated that some of the issues started as far back as 2011. Arsenault read the result of an Australian ballot vote that approved eliminating the elected auditor positions. A hard silence filled the room. Voters overwhelmingly voted against a citizen petition submitted by former Selectboard Member David Andrews to eliminate two Selectboard seats. According to Andrews, Vermont statute requires the minimum of three Selectboard seats. Voters can approve adding two additional ones. Andrews told the audience that he had submitted the petition because the current five-member board allowed for far too many private conversations. Under Vermont statute, whenever a quorum of board members is present, the board must legally warn the meeting. This statute holds even if a quorum of board members should happen to end up at a town event at the same time, regardless of whether they talk town business. For a five-member board, a quorum is three or more members. In Andrews’ opinion, the five-member board allows for two members to freely converse without warning a meeting. The public isn’t privy to these conversations, he said, and that’s not fair. Having a three-member board would halt such whispered conversations, he said. Another resident said that lowering the board number to three would put greater power in the hands of fewer people. Outgoing board member Janet Rasmussen said the board had more work than even five members could handle. Much of the work is complex, she said. In recent years, the board has negotiated deals with Entergy, TransCanada, and VELCO. “Those meetings take a lot of time and require a lot of background reading,” she continued.